I remember it like yesterday. The crowd was anxious for “Nelson Mandela’s” arrival! It was June 1990 and I was home for the summer. My mother called me to the phone and Ibrahim Mu’min a family friend asked if I would like to attend the Nelson Mandela speech? Mandela had in February that year been released after spending 27 years in prison. 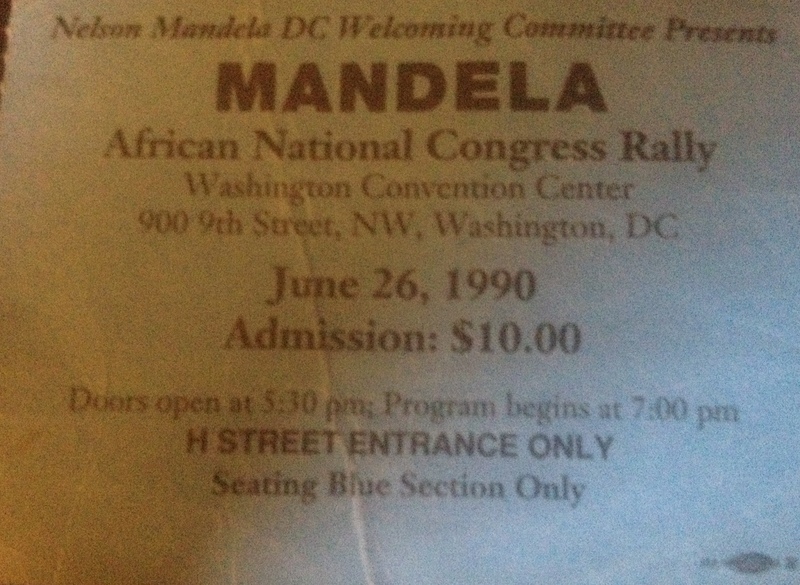 He was to give a speech in DC at one of the most talked about events in DC and I had a ticket! Writing twenty three years later, tears fill my eyes thinking of that blessing and opportunity to see Mandela. I didn’t know then, it would be the only time I would be in the same room as this great man. I’ve been blessed to meet many famous people. On several occasions, I have been near Muhammad Ali who stood up for what he believed. But Mandela, I felt was as close as I would come to meeting someone like Dr. King or Mahatma Ghandi. Seeing and hearing Mandela that day outranks any president or icon I have ever met. That day, I didn’t touch Mandela but he touched me with his presence and his words. I didn’t get to say hello to him, but being in the same room was amazing. The energy and excitement of people celebrating his struggle was powerful. To leave prison and speak about love after 27 years of your life have been stripped and appear peaceful was inspiring. That day changed me just as he changed a nation and moved the world. This is why, I love this man. It is the “power of his example” that made us love him. Today, I am moved not by his death, but by his life. There is no person in my lifetime that has more reach or global recognition than Nelson Mandela. That day, June 26, 1990 we cheered when we were told he was in the building. “he’s in the building.” People on the front row cheered. We all cheered as news spread that he was behind the curtain. When he was introduced, we cheered, clapped and stomped our feet. This humble man from South Africa in that moment was with us. We were with him and we celebrated. When he stepped onto the stage, he waved to the crowd. He walked the stage and the cheering was so loud you could not hear the person next to you. He had not uttered a word yet, we were so happy to see him. I’ve never been a part of a louder audience. That building we were in was torn down a few years ago. New buildings are coming and replacing the old convention center. Perhaps one day a plaque will be placed there, so others will know, he was there. Today, I pulled out my ticket from that day. My piece of history. I will forever be thankful for Ibrahim sharing that ticket. You see he marched as a student, he sat at the lunch counters that were segregated and was arrested during the civil rights movement. Years later, he was arrested protesting apartheid in front of the South African embassy. Mandela inspired many like Ibrahim to stand up to injustice. Mandela’s reach goes farther than his physical stature ever could. Isn’t that God like? His energy moved his country and inspired the world. What I felt that day is stronger today. I understand more today, why his life has so much meaning. None of us will achieve his stature. Because none of us have to endure what he did. We love him because he endured it for us. He is the embodiment of Christ, Moses and Mohammed. He showed us strength and compassion. He belongs to the ages. It is our responsibility to honor him by carrying his message and live his example. Peace, reconciliation, and above all love are what he means to me. My former intern Nadine Moodie is South African and lives there. I asked her to share the mood of her country. I love this man, and I never met him. I love him because his life and example make me want to be a better human being. Often, we face challenges. But nothing can be more challenging than being in prison for standing up for what is right and bending the moral arc of justice. I love him because he leaves a wonderful example for all humanity. hope to each day be more patient, more loving, more compassionate and follow the wonderful example of Madiba. President Mandela, Madiba, thank you for showing us how to forgive, how to reconcile, how to love and above all, Thank You for making the world a better place than the one you were born into 95 years ago. We will miss your physical presence. It is now up to us to teach and inspire future generations by using your words and example. 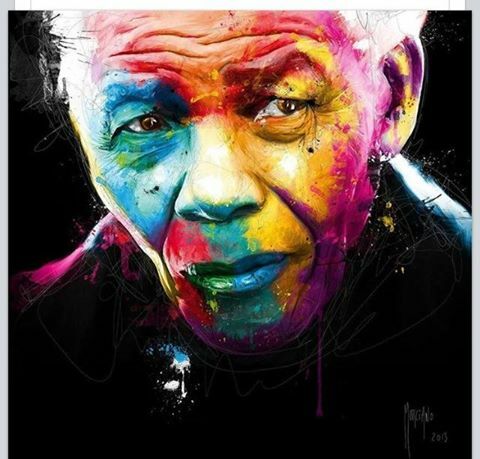 I hope that you will visit http://www.abillionthanksmandela.com and leave a message of appreciation for the man we all love Nelson Mandela.